He said the efficient recovery measures adopted by the bank and supported by a modest growth under core business areas, like retail deposits, particularly CASA, performing advances, other income etc., made it possible for the bank to post decent Q1 financial results, in a scenario of rising NPAs across the banking industry. He said that while the focus will continue to be on the above areas during the ensuing quarters, thrust will also be given to take the bank’s digital banking initiative forward. Digital banking is the key to successful banking, he opined. The Unified Payment Interface (UPI) that bank is in the process of launching, will be a game changer in digital banking and will support customer acquisition and customer retention activities, he added. All the 12 Regional Heads from across the country, heads of the bank’s data centre and customer care centre, Bengaluru, International Division-Mumbai and departmental heads and other senior executives at the bank’s head office also participated. Chief General Manager Mahabaleshwara M S spoke about the bank’s achievements during Q1 of the current fiscal amid uncertainties in the global as well as domestic markets. He stressed upon the need for sustainable and inclusive growth, with all the bank’s branches becoming growth centres and all employees becoming contributors to growth. 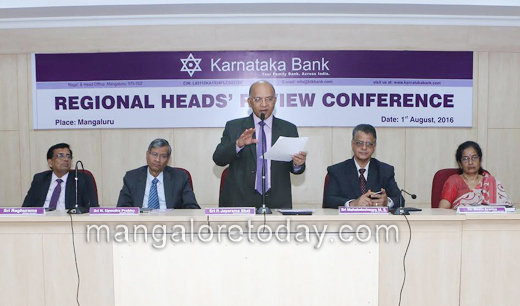 Unlike other banks Karnataka Bank is Customer Friendly .